The Client: British Traditions, Inc. is a Kansas City based manufacturer and reproducer of antique European cabinetry and furniture. British Traditions recreates and wholesales its craftsman quality pieces for designers and high-end furniture stores throughout North America. The Close: British Traditions was growing rapidly and had positioned itself to dominate the local market for premium cabinet systems. Its bank was unable to provide the growth capital and terms acceptable to the owner, so DVS sourced a new banking relationship. 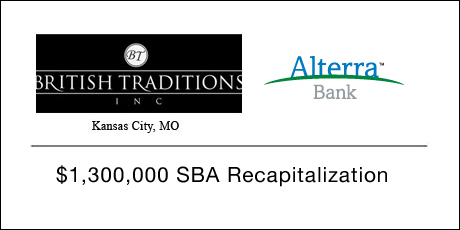 With the help of DVS, British Traditions closed on a new SBA term loan with significant permanent working capital built in as well as a revolving line of credit to fuel further growth.